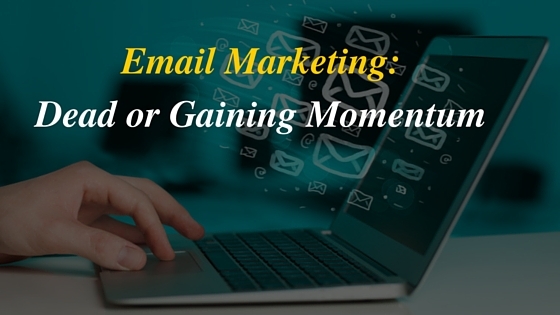 Is Email Marketing Dead or Gaining Momentum? It’s really hard to argue that sending and receiving emails is now often met with a groan.The reason? We are flooded with emails. On an average a person gets 121 a day. Still there’s a question which keeps on revolving around the head of marketers Is Email Marketing DEAD? The answer is No. Email marketing has definitely got old but isn’t dead yet. It’s definitely have been changed a lot but not yet dead. For email the old postcard rule applies. Nobody else is supposed to read your postcards but you’d be a fool if you wrote anything private on it. But there must be a good reason why that much email marketing is gaining the momentum, and if so that’d mean that the claim about the death of the email marketing can’t be true. When I hear someone saying that email marketing is dead! I believe that these data is enough to say why the claim that “email marketing is dead”, is not correct. Email marketing is not dead but evaluation is the rule of the universe, email marketing is getting evaluated day by day. Although there are a lot of communication channels available but emails are the most efficient and professional channel to get connected with your consumers. The Best time to call your clients is EMAIL! 42% of businesses say email is one of their most effective lead generation channels. So, Email is not going to dead anyway until Robots will kill us because people will not stop writing and sending. Numbers are enough to describe that Email Marketing is not dead and even going to, definitely it’s changing from Desktop to laptop and Laptop to Mobiles.